Seems lots of people while they like my wolf guard definitely think that the storm bolter should be a different colour. So many in fact that it gets it’s own post. Now, I did make the decision for a reason, and I’m going to try to explain, not to convince you all that I’m right, but so that we can have reasoned debate on the subject and so that you all have the information that I’m working from. In my mind there are three possible colours that a Wolf Guard bolter could be, Yellow, Red or Black. This colour really isn't anywhere on the model, and it would be adding another, model that doesn't really “fit” in the scheme, you see gold and blue are complimentary, they work well together, red really doesn't fit in that picture in my mind. And black. which would make sense, he has a black shoulder pad, it wouldn't clash colour wise.. but. I’m using NMM for the metals, including the silver. so I’d have to not highlight or blend the black at all, or run the risk again that it would look like more metal.. so its have to just have an edge highlight, and I was worried that basic pant might throw off what I was trying to achieve with the model. I tried it on my grey hunters, and I'm not sure how successful it is..
On this guy it works because of the gold border, not sure how well it works without it.. So there are some mock ups and a catalogue of my worries about the different possibilities. In the face of them I went with armour-colour, as a last question on top of those other points..
Do you think it needs to be another colour because you think it would look better, or simply because they usually are? Personally I liked the bolter matching the armour as I think the model already has enough points of interest to not require the bolter to be made to stand out. If you do change the colour I prefer the yellow over the other two and as long as there is a clear enough distinction in tone between the yellow & gold it shouldn't look like a poor NMM job. I actually really like the black with gold trim casing on the grey hunter - could you try something similar? Mostly black with a bit of NMM gold in there somewhere? What about hazard striping black and yellow? Makes it clear that it's not supposed to be NMM, but has colors that fit in with the rest of the model. Black, others add a bit too much color in my opinion. And can't you simply use different colors for the black than NMM? 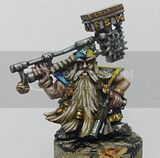 Blueish/greyish depending on what is on the NMM? You're not painting the storm bolter to stand out, so both red and yellow are the incorrect choice. Since there is black on his right shoulder pad, you're not expanding the palette or running into the issues of "washing out" your NMM effects. My major issue is that the model almost looks unfinished as it stands now. Thankyou guys for taking the time to feed back, it's really useful. black seems to be the consensus, with yellow close behind..
Tzeentchling, I had actually planned to do chainfists hazard striped, not sure how that would carry over.. I might go for a black, and look at some ways to break the plain black, I'm a tad wporried that a flat black with an edge highlight might bring "down2 the paintwork I've done so far.. or I might after all leave them, I'm still not totally decided. Jonathan, I have to ask, is it the bolter that makes it look unfinished to you, or something else? As long as it has some yellow/gold highlight elements to match with the interesting bits on the rest of the model.